What is Vertical and Horizontal Gas Porting For Your Pistons? We explain the differences between horizontal and vertical gas porting on a piston and how it plays a role on ring seal. Is horizontal (laterial) or vertical gas porting better for you? The Las Vegas P.R. guy who coined the line “What happens in Vegas, stays in Vegas” should be justifiably proud of his creation. We’re going to corrupt that slightly and change it to “What happens in the combustion space - should stay in the combustion space.” Okay, ours isn’t nearly as catchy, but it does ring true. The key to making power assumes all that hard-earned cylinder pressure should be sealed by the rings so it can make that mighty push against the crank. Much has been written about all the different styles of piston rings, thickness, radial tension, back-cut chamfers, and all the rest. Much less is detailed about using cylinder pressure to improve ring seal to the cylinder wall. Gas porting has been around for decades and is a technique that is especially popular in short run-time applications like drag racing. This illustration reveals both the vertical and lateral gas port paths that apply cylinder pressure to the back side of the top ring to increasing sealing load. There are enough details about gas porting to justify a short excursion down the technology tunnel to investigate. Our guide in this adventure is engineer Clayton Stothers and the rest of the engineering team at JE Pistons who have years of experience with piston design and ring seal. Stothers emphasized that, like most other systems in an engine, ring seal is a function of multiple factors. 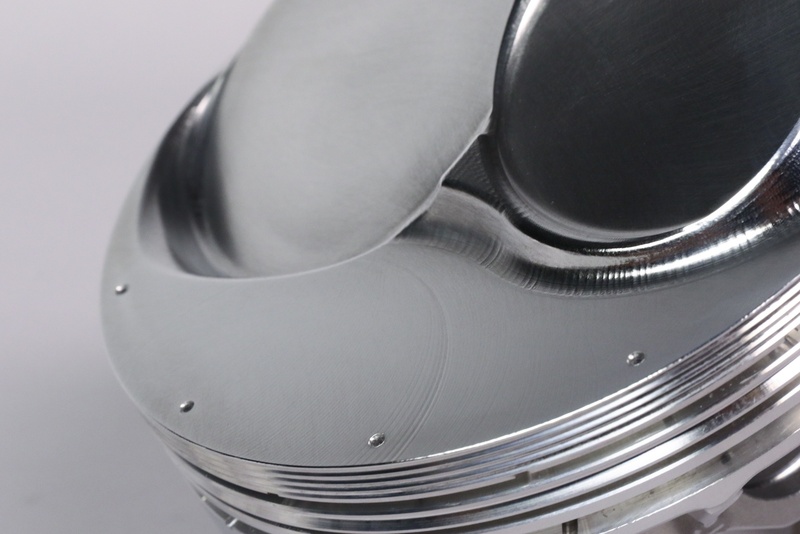 Certainly the cylinder’s taper, bore concentricity, and surface finish play important roles. But beyond that, it would be wise to address radial ring tension and contact area as ways to reduce engine friction and improve ring seal. All top rings rely on cylinder pressure to help seal the ring during the compression, combustion, and exhaust strokes. The only place where static radial (outward) ring tension really is critical is during the intake stroke. Based on this, reducing tension by choosing a thinner ring would be an advantage. That’s reinforced by the OEM march to increasingly thinner ring packages. There are production engines right now that feature a top ring thickness of 1mm (0.039-inch) or less. 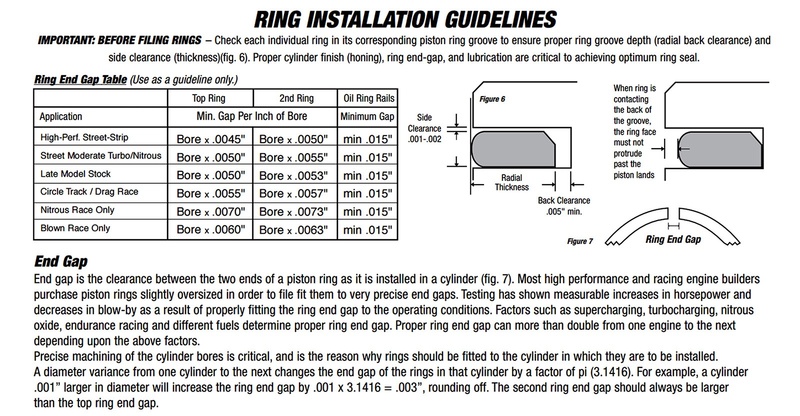 This call-out from JE’s 2618 piston instructions offers guidance for setting not only back and side clearance figures but also details for setting top and second ring end gaps. An ideal ring end gap creates the smallest leak path possible past the top ring. Note that the second ring gap is larger, intended to minimize trapping pressure between the rings. A big portion of top ring seal is created by cylinder pressure pushing the ring outward from the back side of ring to improve the seal. There are actually two separate gas porting paths that can be used to improve top ring seal. Vertical gas ports offer the most efficient approach since the holes are drilled directly from the piston top into the back side of the top ring land. A big advantage to gas porting is this allows the option to select a lower radial tension ring to further reduce friction, using the additional cylinder pressure to increase the load on the ring to ensure a positive seal. As an aside, this might make a difference in terms of evaluating the ring seal based purely on leak-down testing since the rings offer lower static ring tension. What are Vertical Gas Ports? The classic approach for gas porting has always been the aforementioned vertical gas ports. Stothers says that the placement and actual number of vertical ports is determined both by piston diameter as well as real estate limitations driven by intake valve relief locations. For a typical 4.00-inch bore piston, JE will typically add between 10 and 14 vertical gas ports. Vertical gas ports have been around for decades –intended mainly for high-end drag race engines. Many of us first read about them in Grumpy Jenkins’ book 'The Chevrolet Racing Engine' published in 1976. Much has changed since those early days. These vertical gas ports are typically 0.045-inch in diameter. The biggest detractor with vertical gas ports is the ease with which they can be closed due to carbon and combustion residue. 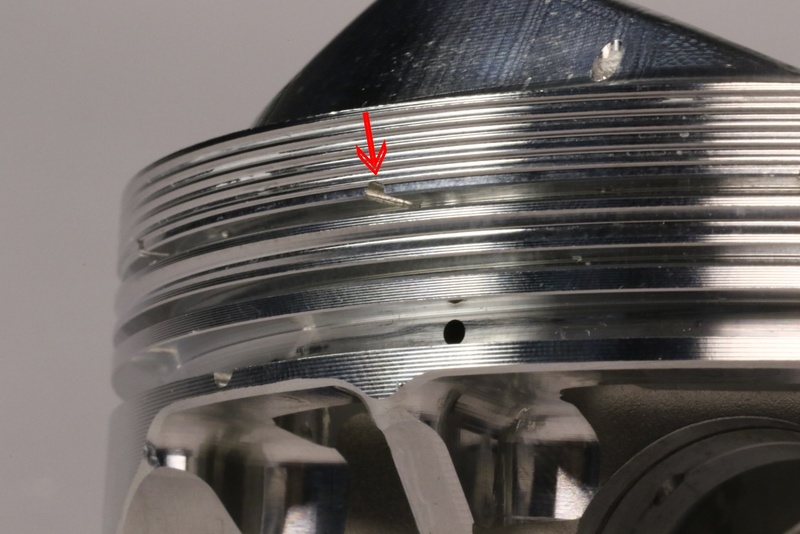 This is one reason why vertical gas ports are not often found on street engines – combined with the effect of increased ring wear from the increased cylinder pressure loading. As a possible alternative, E85 offers the advantage of a much lower carbon count compared to gasoline so residue could be expected to be reduced. What are Horizontal (lateral) Gas Ports? A more recent advancement in piston design is lateral (horizontal) gas ports as a standard feature on certain JE gas port (GP) pistons and an option on many others. This process places gas ports above top of the top ring land to provide combustion pressure access to the back side of the ring. Because these lateral holes are somewhat restricted by the small area above the top ring land, they are not quite as effective but are also not subject to clogging concerns. Lateral gas ports are most often seen in circle track applications but could also be a useful component for an optimized normally aspirated street engine. These holes are most usually larger at 0.060-inch with a similar count around the circumference. JE calls these lateral or horizontal gas ports. Located directly above the top ring groove, these ports perform a similar but not quite as effective a job as vertical gas ports. Lateral gas ports are often found on pistons intended for circle track racing. An easy way to identify a JE piston that offers lateral gas ports, for example, is to look for the GP initials in the piston description. Examples include the big-block Chevy, open chamber lightweight FSR GP piston. The GP can also refer to vertical gas ported pistons like JE’s big-block Chevy Nitrous GP piston, so be sure to read the descriptions carefully as these pistons employ both vertical and lateral gas ports. “The type of ring and the treatment to the face will also help to reduce the amount of ring wear. For example, a stainless ring with gas nitride will help resist the accelerated wear that some people see with gas ports.” In essence it becomes a balancing act between increasing radial tension to improve sealing or reducing this same tension to minimize wear. By adding load with cylinder pressure, this may be an effective way to achieve both goals. Tight side clearances are also a function of ring wear. Loose side clearances make pressurizing the rings much more difficult. So you can see that gas ports unto themselves will help, but will be far more effective if other ring clearances such as side and end gaps are also closely maintained. An important feature here is how flat the rings grooves are when machined. Long gone are the days when those crude carbon ring groove scrapers were used to clean pistons for re-use! Ring end gap is another important consideration but Stothers says he doesn’t see a real change in ring end gaps with the addition of either vertical or lateral gas ports. Of greater importance is sealing the top ring as efficiently as possible to prevent generating pressure between the top and second ring. While many still refer to the second ring as a compression ring, it’s primary function is to control oil that was not removed by the oil rings. This justifies the appearance of pressure accumulator grooves in the piston between the top and second ring lands. This is intended to minimize the effect of an increase in pressure between the two rings. As pressure between the rings increases, it counterbalances the load on the top ring, reducing the positive effects of pressure behind the ring. Admittedly this discussion has been mostly oriented toward the theoretical side. It’s true that lateral gas ports could be used on a normally aspirated performance street engine with little concern for an increase in ring or bore wear. Since each application would be very specific, this would be where accessing a piston manufacturer’s immense knowledge base with respect to issues like ring material, side clearance, end gaps, and other esoteric specs would help to make the proper informed decision. While the average builder may think that gas porting is only for drag racers, smarter builders have already started applying gas porting to a wider arena of performance engines. 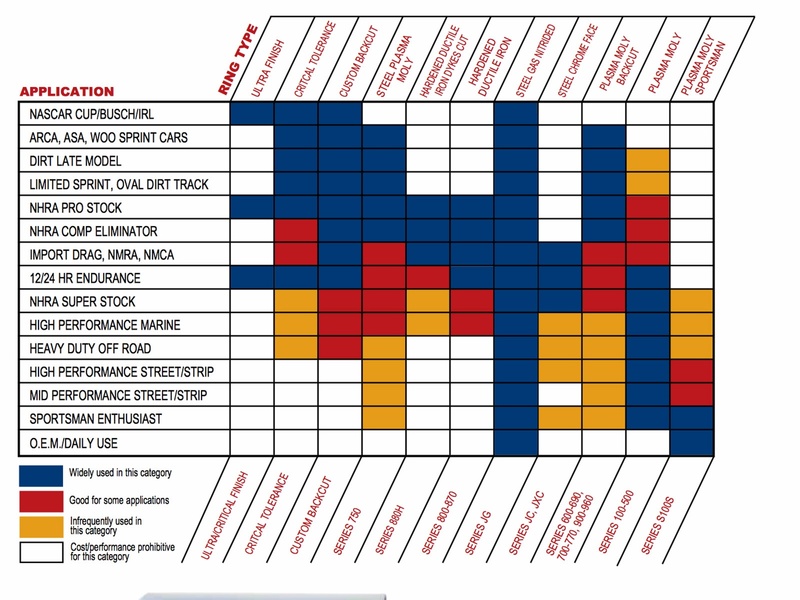 JE offers a ring selection matrix in the catalog to help with the decision of ring type to complement your piston selection.